YouTube added a cool feature for videos with closed captions: you can now click on the "transcript" button to expand the entire listing. If you click on a line, YouTube will show the excerpt from the video corresponding to the text. If you use your browser's find feature, you can even search inside the video. Here's an example of video that includes a transcript. 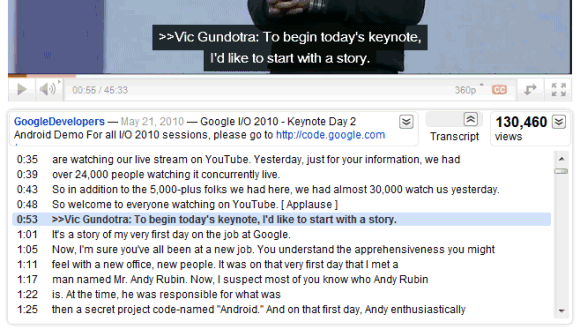 YouTube lets you upload a transcript file for a video and it can automatically generate the appropriate timestamps. "YouTube uses experimental speech recognition technology to provide automatic timing for your English transcript. Automatic timing creates a caption file that you can download." hey, thanks for telling people about this. we released it quietly last week and excited to see people using it. our goal is to make every video accessible and useful to every youtube user, so the transcript work is an effort in that direction. if folks have any comments or suggestions pls let us know! Hi Hunter, The youtube transcripts on the videos are terribly incorrect. How do you plan to make these more accurate? Great feature! Especially taking into account that transcripts are searchable. To make them even more searchable I would like to have a possibility to search ALL youtube transcripts through google search engine. I've been watching some stand up comedy and the transcriipts are even funnier! Who does them? My question is: Do youtube transcripts work on mobile platforms. as of today 7/2/13.? Thanx. I came across this feature earlier in the week and sent it to a few mates, they all thought it was very handy. This will be a huge win for YouTube if they can enable the transcript to be indexed by Google search, it'll make finding great video content that much easier. Pretty cool. I still prefer the implementation that ProTranscript.com offers. Though, YouTube's solution is free but I can only wonder how good their voice recognition technology is. I discovered the transcript feature, cool! Would like to have this feature for embedded videos too! That would be really great. YYYEEEESSSS. For all those 60-minute lecture videos posted on YouTube (see also: Google TechTalks), this feature is absolutely game changing. Killer =) I just saw this today, and I'm more excited about this than the iPhone 4! VIVID Books also does this for YouTube vids. Dblclick on word in transcript to jump. Includes table of contents for navigation. Instead of transcript being one gigantic paragraph, it can be broken into sections. Can bookmark sections within the transcript as well. Searches can be done across videos. Wow, this is free? Up until now, I've been using protranscript.com for interactive transcripts. Is there a way to link to a video with this on by default? I'm thinking like with the deep linking, where you can specify the time to start at, a parameter so the page would load with the interactive transcript open. Transcripts are cool, but using it for subtitles is cooler. Just found a German video series that used to be posted with English subtitles, but those videos have since disappeared. However, now the German version has the subtitles available via Interactive Transcripts. This is beyond awesome. question: is this at all practical for transcribing video that is subject to confidentiality agreements (ie stuff that hasn't aired yet). i am completely new to transcribing, i just had a chance to pick up some work but getting set up has been a disaster. i'm searching for a software to bypass the nonsense i've been running into with the vpedal free plugins. it doesn't even work right! why is there only one comment saying that it's inaccurate? It's not a good program! This transcribing system doesn't work. No wonder it's free. how come the Interactive Transcript is'nt on ALL YouTube videos? Here is an example of how 'speech recognition' can give faulty "Interactive transcript"
This is the daily routine closing ceremony of members of mini forest laughter club, J P Nagar, Bangalore, India. First they gather in two files facing each other. Then they light imaginary fire and throw all their worries into that and burn them. The fire is doused soon after. Now they pluck imaginary flowers form a tree and sprinkle them on each other. Each ritual is followed by clapping of hands and shouting Ho, Ho, Ha, Ha, Ha. This is followed by placing both their palms on the head and saying loudly, "let us learn all good things from each other"
Great new feature! Can I correct errors to the transcripts? Great feature! My clients have been asking that I this. There are some errors to the text. How can I fix these? And yet another thing. I would like to have a "copy text" feature from transcription interactive window, just like in ordinary text editor. Love the concept of interactive transcripts :-) but you do get some odd transcribing at times! How can we either correct the transcript in youtube or download the transcript as a correctable text file as a basis and then upload? I’m sorry, this feature is atrocious, especially with videos featuring American narrators. The transcripts are seriously horrendous, e.g. ‘acrylic painting’ being rendered as ‘credit rating’, and ‘we get ahead of ourselves’ as ‘we get a hotbed of ourselves’. Search - I want to search ALL transcripts for specific phrases.